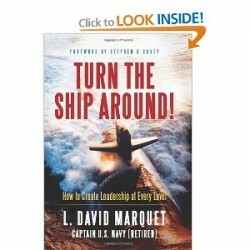 I was very excited to read my copy of�Turn the Ship Around! How to Create Leadership at Every Level by L. David Marquet (here on Amazon). I actually found out about the book through a random link that I followed on Twitter. The link led me to a video interview of the author, and it excited me enough to hunt down the publisher and request a copy of the book. At its core, this book is about changing the leader-follower model to a leader-leader model. It’s written by a man who spent years in the military (which is probably the most pervasive user of the leader-follower model of any organization you’ll find), so it instantly sticks out as an innovative idea. As always, I have a laundry list of concepts from the book that I hope to test in my own role, but here are a few that I think are the most powerful. Many people would suggest “empowerment” as the solution to the leader-follower model. The problem with empowerment is that it’s a contradiction! How do you get empowerment? Someone has to give you permission to be empowered.�Kind of defeats the purpose, right? One of my favorite quotes: “Officers are rewarded for being indispensable, for being missed after they depart. When the performance of a unit goes down after an officer leaves, it is taken as a sign that he was a good leader, not that he was ineffective at training his people properly.” I think organizational success can be measured by how well leaders set the organization up for long term success, not just for the short time they are employed. We have been able to pretty much keep things going “business as usual” since my manager stepped down last month, and I attribute that to great transition help and a strong team work ethic, not that she was a poor/unnecessary contributor to the business. If you’ve taken a management class, you’ve heard the term “management by walking around” or MBWA. MBWA sounds technical. It sounds like you need to be wandering around, checking up on your people, and making sure they are putting in 100% of their effort. Mr. Marquet offers a solution that is brilliant and much less intrusive/confrontational. He puts it as “be curious.” Much less intimidating and more engaging for both parties involved. Instead of asking questions from a “Let me catch you doing something wrong” perspective, questions are asked from a “I genuinely want to learn more about what you do” angle. All in all, it’s a great leadership book for organizations and leaders that are trying to break free from the traditional leader-follower model and get people engaged in leading themselves. Interested? Click here to get your copy. This book focuses on leadership, culture, and strong communication. Highly recommended for those looking to empower and influence employees to become leaders. This entry was posted in General and tagged Book Review, Leadership on September 21, 2012 by Ben.